R.I.G.L. 34-4-27 requires that either the trust agreement or a memorandum of trust be recorded when a trustee conveys real property held in trust. Prior to the ratification of this statute, trustees were required to record the trust instrument -- the document executed by the settlor that designates the trustee, the trust beneficiaries, and the provisions for the trustee's management of trust assets. Now, trustees in Rhode Island have the option to record an affidavit or memorandum of trust, allowing the trust instrument to remain off-record (thereby keeping the settlor's estate plans private to nonessential parties). Third parties (that is, neither the settlor nor the trustee) entering into transactions with a trustee may rely on the statements provided in the affidavit or memorandum of trust as fact. The affidavit evidences the trustee's authority to convey title to real property held in the trust and acts as a summary of essential terms of the trust instrument. It contains such information as the name, date, settlor, and original trustee of the trust. In addition, it names all currently acting trustees and contains statements as to (1) the trustee's authority regarding real property transactions and (2) the ability of the trust to be revoked or terminated. In addition, the instrument details the conditions under which the trustees may be replaced and a successor trustee appointed. It also shares the conditions upon which the trust terminates and, if the trust is revocable, the conditions upon which the trust becomes irrevocable. For example, the affidavit might state that the trust becomes irrevocable upon the settlor's death, as is the case with living trusts. If applicable, the affidavit should include the date and place of the settlor's death. A memorandum of trust must be executed "either by each settlor of the trust, or by each current trustee" and notarized before being recorded in the municipality where the subject property is situated (R.I.G.L. 34-4-24(a)). 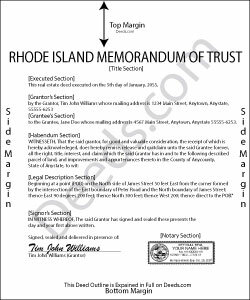 Consult an attorney with questions about Rhode Island trusts and the affidavit/memorandum of trust. john g. said: no problems got what i needed. Reply from Staff: Thanks John. Robert C. said: I hope I have the right form. My deed should be for a mfg home.